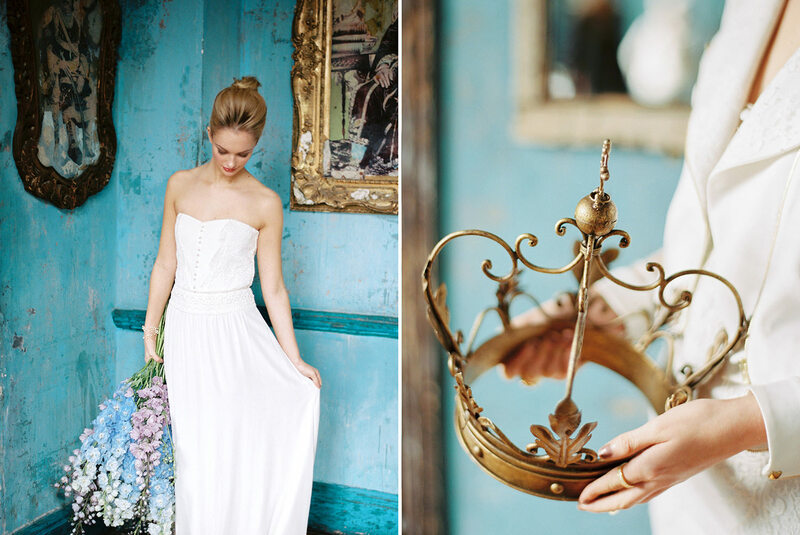 Something blue inspirational shoot with The Mews Bridal. 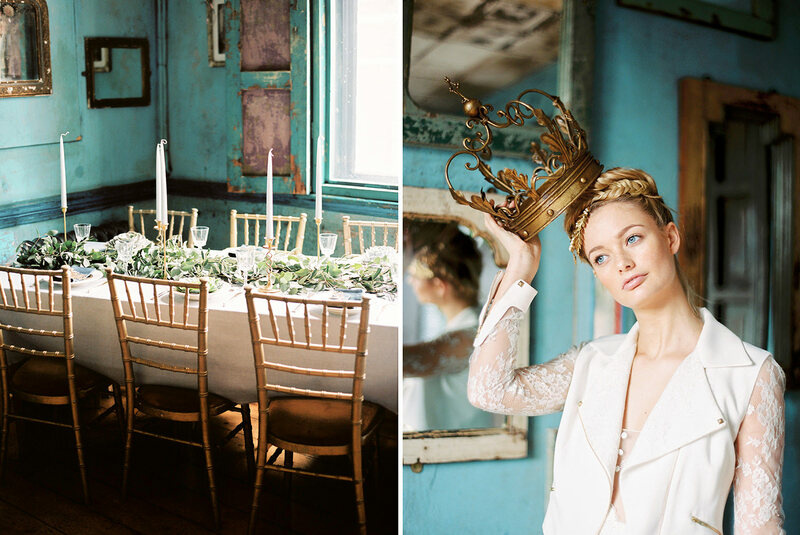 Something blue was inspired by the private dining room at Paradise by way of Kensal Green. 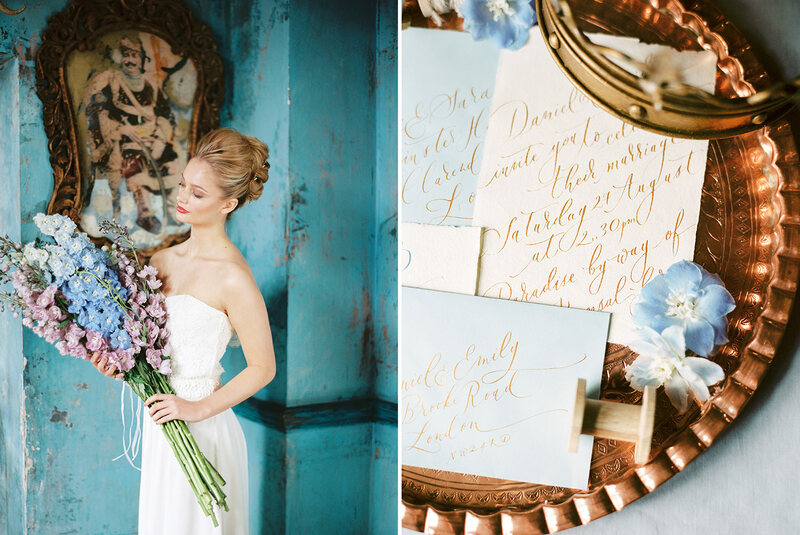 The room has the most gorgeous tones of blues which I wanted to be the emphasis of the shoot. Collaborating with a fantastic team, I drew in cool blues, greys and golds throughout all aspects. 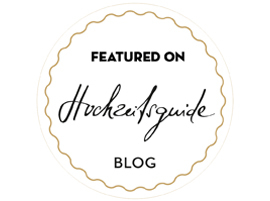 I wanted a relaxed, bohemian look so approached Lucy Purbrick, one of the stylists at The Mews of Notting Hill and both herself and Lauren there shared my vision and selected stunning pieces from Laure de Sagazan and Rime Arodaky (including a rock chic jacket!). Lucy was also there on the day to help style the model and bring her look together. I’ve worked with Ana Ospina Make up and Jo Irving from Lovehair many times so I was delighted to have them on board for this shoot to complete the models look. The gold hair accessories were from the talented Kelly Spence, along with gorgeous pale grey suede shoes from Emmy. To complete the boho look I used various pieces from Cotton & Gems including rings, bangles and ear cuffs. Award winning florist, Sarah Harper was a huge asset to the team. Sarah took the reins for the styled table, incorporating the various pieces I’d sourced from Helene Millot along with her beautiful oversized succulents and the table runner of eucalyptus to maintain the subtle hues. 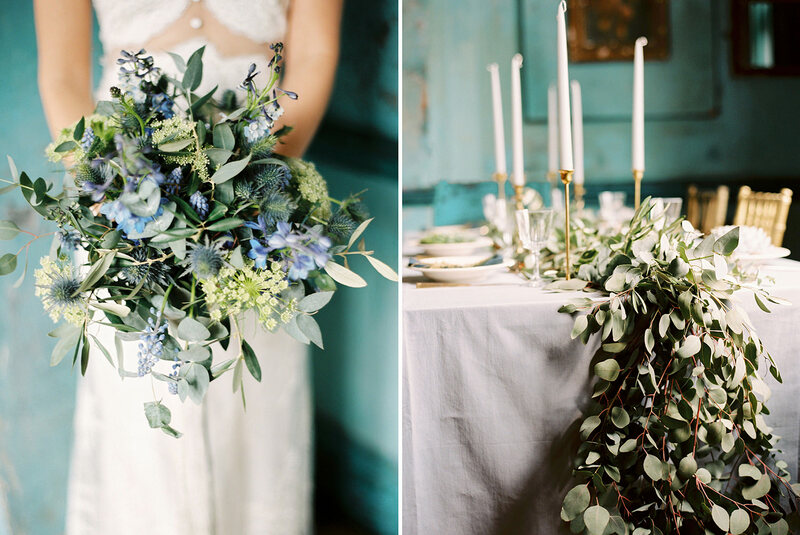 Sarah also created a stunning bouquet for the model using eucalyptus, blue thistles, musscarri and blue delphiniums. I was also inspired by the poem The Chaos of Stars. Using natural dyed silk ribbon from Lancaster and Cornish, calligrapher Lamplighter London wrote the poem onto it. This was used for the bouquet. Lamplighter London also produced the stationery with gold ink on subtle blue and cream textured papers. 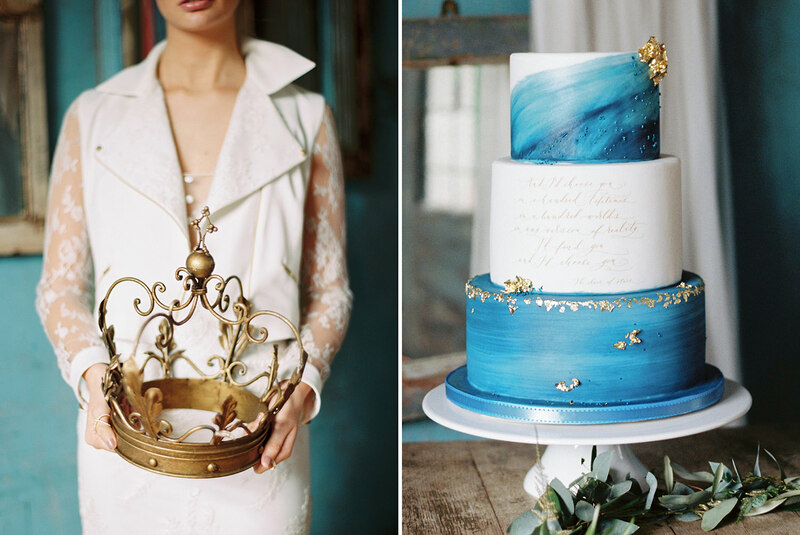 She also wrote the poem for Cakes by Krishanthi to use on the incredible 3 tier blue and gold leaf cake. 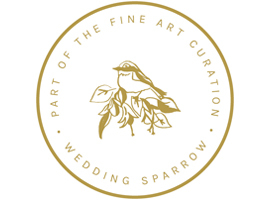 I’m absolutely delighted that Something Blue was published on Wedding Sparrow, the film only blog. 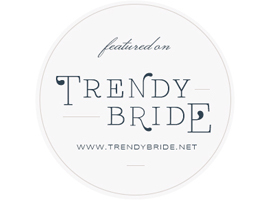 The shoot has also been featured on Hochzeitsguide, a beautiful German inspirational blog and Trendy Bride in the US. Huge thanks to Carmencita Film Lab too for their continued support and awesome work! 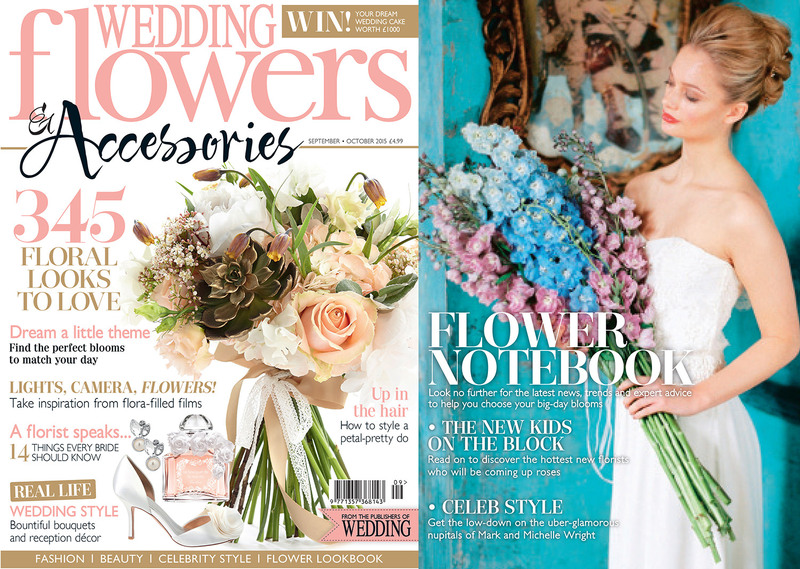 I’m thrilled to say that Wedding Flowers magazine have also published this shoot, on their inspirational pages for the last 2 issues. What an amazing response to this shoot, I couldn’t be happier! 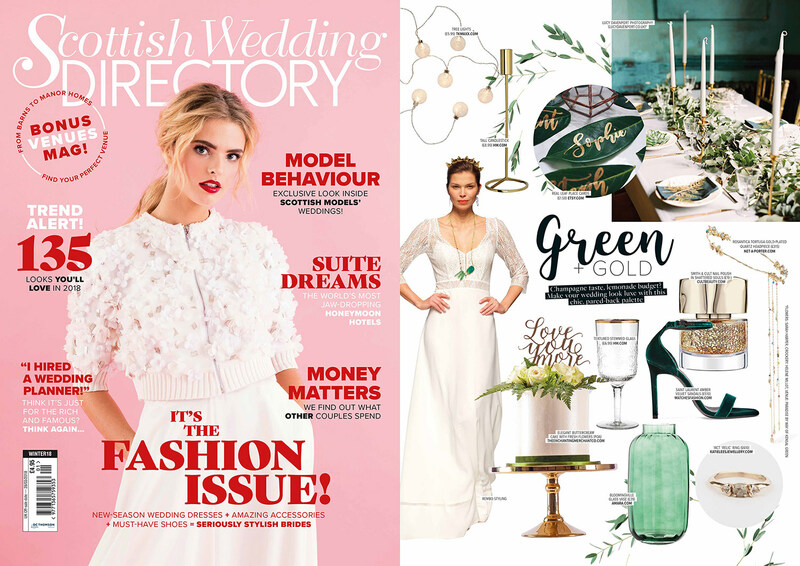 I’m overwhelmed by the response to this shoot and it’s even caught the eyes of Conde Nast Brides US for a cake feature that they ran. 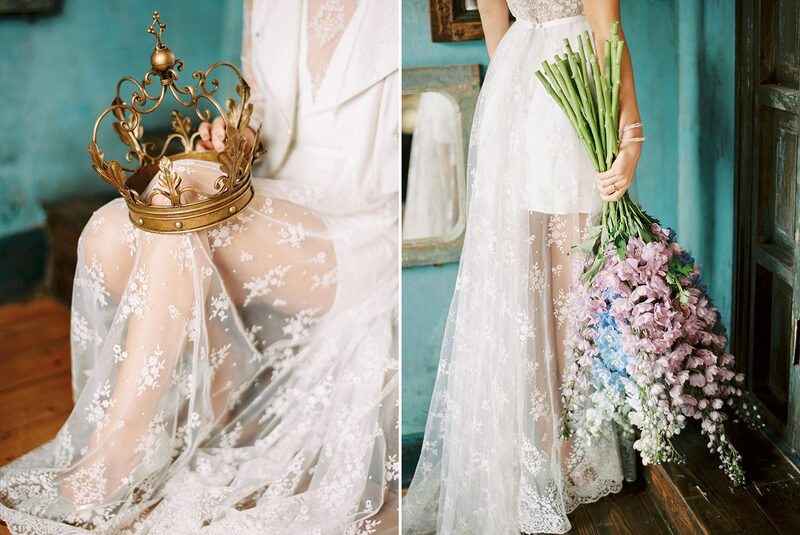 The latest feature for this Something Blue shoot is over on Fine Art Wedding Boutique. 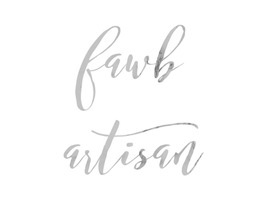 Thank you Kate for publishing this on your beautiful blog. It’s always lovely to be approached for image usage when an editor has stumbled across one of my photos on Pinterest. This is what happened with the Scottish Wedding Directory. 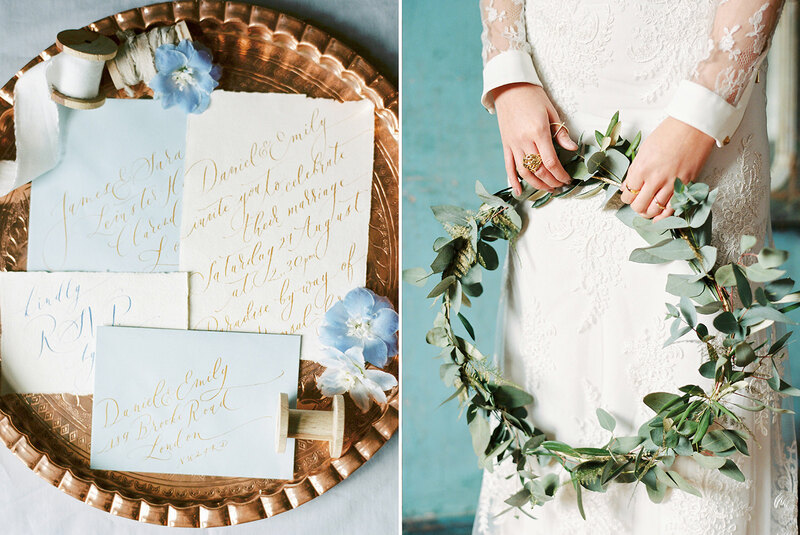 How gorgeous is there inspirational spread below? Were you inspired by something blue? Why not look at this pink inspired Rebecca K Events branding shoot?